Organizers of a clean water summit in Chicago next week hope to draft a plan for replacing the city's nearly 400,000 lead water pipes. The event will feature Milwaukee Mayor Tom Barrett, whose visit comes just months after he signed an ordinance creating a plan to begin replacing Milwaukee’s 68,300 residential lead pipes. Although parts of the plan have been criticized, local advocates think it can serve as a model for kickstarting the massive project in Chicago. 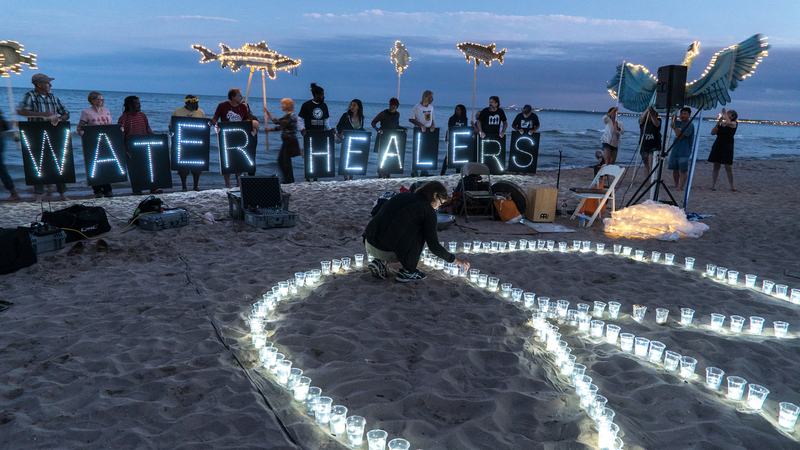 On May 10-11, Havrelock's Freshwater Lab hosts a summit titled “Untrouble the Waters" that will bring together government officials, researchers and community leaders who represent communities that are dependent on the Great Lakes. Among the speakers and panel leaders are Barrett and Kirsten Shead, a community organizer with the Milwaukee Water Commons, which played a role in the city’s plan to replace lead service lines. Milwaukee Mayor Tom Barrett (Great Lakes Now) Under the city’s new ordinance, the Milwaukee Water Works will start replacing lead pipes that deliver water from street mains to homes. The city will also replace lead service lines with copper at about 385 licensed child care centers and eight private schools, according to the Milwaukee Journal Sentinel. In cases of emergency pipe failures or leaks, the city will pay 100 percent of the cost for the public utility side, along with two-thirds of the cost to replace privately owned lateral pipes that connect municipal water mains to residences. The cost of replacing privately owned pipes will be capped at $1,600 for owners, who will get up to 10 years to pay. Shead said it took sustained public pressure to get city officials to admit that Milwaukee’s lead service lines were a problem. “My perception was that it ended up being an image crisis [for the city],” she said. “But the community doesn’t want a false reassurance. They want an honest explanation of the problem. There is no safe level of lead exposure for humans, according to the Environmental Protection Agency and the Centers for Disease Control and Prevention. Exposure to the toxic metal is particularly dangerous for children and can cause irreversible damage to developing brains and nervous systems, along with miscarriages, cognitive dysfunction and other health issues. Despite the health risks posed by lead pipes, Chicago has resisted calls to undertake an overhaul of the city’s estimated 385,000 lead service lines, even as cities like Milwaukee, Pittsburgh and St. Paul launch replacement programs, as detailed last year by the Chicago Tribune. The Tribune reported that Chicago has more lead service lines than any other city and required them by law until 1986, when Congress banned the use of lead pipes to deliver drinking water. Milwaukee, by comparison, required lead service lines until 1948 and banned them in 1962. Chicago Public Schools officials released data last year showing high lead levels in water at 113 CPS schools, some of which are shown here. After the lead water crisis in Flint, Michigan, raised concerns about the issue nationwide, Chicago Mayor Rahm Emanuel announced that residents could request free water testing using the city’s 311 phone service. If lead levels at residences exceeded the EPA’s threshold for action, the city’s Department of Water Management would schedule a visit with a plumber and electrician to identify the source of the lead and develop a mitigation plan. The city also said it would make lead testing results available online. But testing is often problematic, Shead said. During next week’s summit, participants will hear from Barrett on Wednesday about Milwaukee’s lead-pipe replacement plan. On Thursday, a working group on water delivery and lead pipes will discuss recent water crises in Flint and Washington, D.C. The group will also highlight places like Madison, Wisconsin, and Lansing, Michigan, where entire water delivery systems have been replaced. By the end of the summit, Havrelock said the group will have at least started to formulate a plan for replacing lead service lines that can be pitched to Chicago officials. “We’re convening this to be able to bring something specific with some examples to the city,” she said. Emanuel notified UIC that he cannot attend the summit because of a previous commitment, UIC spokesperson Brian Flood said. Along with Shead, the Milwaukee community organizer, the water and lead pipe working group will include Yanna Lambrinidou, an expert on lead in drinking water in Virginia Tech’s Department of Science and Technology; Oday Salim, an attorney focused on water rights at the Great Lakes Environmental Law Center; Melissa Mays, organizer with Flint Rising; and Tio Hardiman, executive director of Violence Interrupters, a Chicago organization that aims to mediate gang conflicts before they turn violent. Hardiman’s inclusion in the group reflects the connection between lead and violence in Chicago, Havrelock said. Studies have shown links between lead exposure and violent behavior, including studies of Chicago children exposed to lead. “We’re thinking about, to what degree can lead pipe replacement decrease violence in the city?” Havrelock said. Shead said she’s looking forward to initiating a dialogue in Chicago about confronting the issue of lead water pipes. April 27: With nearly $300 million in federal funding on the chopping block, leaders from across the Great Lakes region will convene next month in Chicago to address lead poisoning, oil pipelines and other threats to the area’s waters. June 21: In light of the elevated lead levels found at Chicago Public Schools, we ask local experts what high lead levels mean for your health.